Blair Candy Has the Sweetest Picks for Shark Week! Yes, dear reader. It is finally here. That glorious week awaited by millions – nay, billions! – across the universe. The one…the only…SHARK WEEK. Discovery Channel’s Shark Week is anticipated by some the way an anxious child awaits Christmas morning. Typical plans for the week are cancelled or never made. Perhaps a few sick days have even been saved up for some Shark Week sniffles – dangerous business; definitely should stay home! But while your remote may get a vacation during Shark Week as you watch show after show without fail, your belly is gonna start to grumble. Man and woman cannot live by Shark Week alone. You need to keep up your strength so you don’t miss anything! So what to put on the Shark Week menu? Seafood is always a good choice. Watching sharks, eating like sharks, makes sense to us! And when the time comes for dessert or a late night snack, you can keep the ocean theme wave rolling in. Don’t worry – we don’t have any recipes for crab flavored ice cream up our sleeves. Just some sweet, summery treats that are shark-tastic! 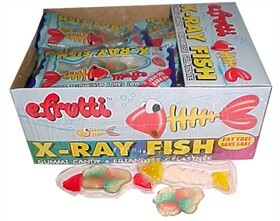 Gummi X-Ray Fish – These fruity gummies are fun to look at and neat to eat – gummy bones and all! Each box contains 36 see-through fishies, individually-wrapped and ready to enjoy. Swedish Fish Aqua Life – Offering all the fabulous favors the Swedish Fish family of gummies has to offer, Aqua Life brings quite a bounty of oceany options, including gummy starfish, gummy blowfish, and gummy dolphins and seahorses. Just like so many of you, I include candy as a major memory trigger for me, whether the memory involves the candy itself or is generally representative of a point in time. But it isn’t candy alone that occupies the sweet spectrum of my mind – there’s enough gum in there as well to make my 4th grade teacher give me detention! Fruit Stripe Gum – I enjoyed a pack of Fruit Stripe gum recently, and am happy to report that it tastes the same as it did years ago. It has the same powdery finish, the familiar colored stripes, and while I’m not positive it had “Yipes In Action” tattoos on the wrappers in the past, it certainly does now! And of course there is the adorable Fruit Stripe Zebra, playing soccer as zebras so often do! But what has changed is the packaging itself. 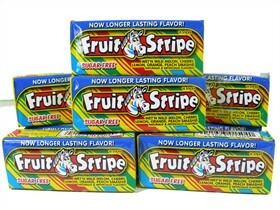 When I was a youngster Fruit Stripe gum came in a tin, much like past containers of Band-Aids. And while the gum was a tasty treat, deciding what to do with the tin upon the gum’s completion was a fiesta of fun! It often held change, though it was no stranger to ChapStick and Bonne Bell Lip Smackers. And I can’t forget the notes passed in class! Oh yes, saved notes were perfect for the Fruit Stripe gum tins, and the bonus was that spending enough time in the tin made them smell ever-so-faintly fruity. Freedent Gum – Freedent gum reminds me of my Gram. She had false teeth, and Freedent was her gum of choice as it didn’t stick to her teeth, and it had a fresh, minty flavor. My Gram only ever chewed a half stick of gum at a time, and kept her gum in the cabinet above the microwave, near the drinking glasses. Her glasses were stored on a Lazy Susan, and I would always spin them slowly for several minutes before choosing which I’d use that day. She had been to visit a lot of places over the years, and I think she bought a glass everywhere she went. Finding the perfect one took some time! Once I’d picked my glass, I would fill it with ice cubes and Ginger Ale – Gram always had Ginger Ale – and then I’d nonchalantly ask if I could have a piece of Freedent (as if I didn’t ask every time!). Gram was always generous with whatever she had, and her favorite gum was no exception. But while we both enjoyed Freedent, unlike her I liked to chew a lot of gum at once, so I would chew the half-piece that was almost always there along with a full piece for the perfect amount! Women Are From Venus, New American Candy Jobs Are From Mars! If you haven’t heard the exciting news already, Mars Chocolate is building a new chocolate factory in Topeka, Kansas – their first new American chocolate factory in 35 years! At a time when Americans need jobs more than almost ever, this $250 million investment will bring 200 jobs right out of the gate, with numbers possibly rising to as many as 1,000 jobs moving forward. That’s a lot of jobs and a lot of candy, and those are 2 of our favorite things! 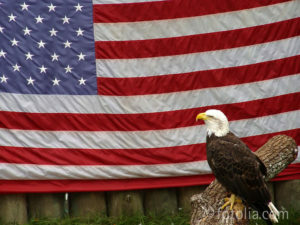 We first read this exciting story in the abc NEWS/Money section of their website in an article titled, “Made in America: From Candy to Candles, Companies Bring Jobs Home”. The article goes on to explain that this won’t simply be any old factory, but a “facility to meet LEEDS [Leadership in Energy and Environment Design] Gold standards for construction and building efficiency as well as to take advantage of sustainable energy resources that the state of Kansas has to offer.” New jobs, American-made candy, and environmental-friendliness? I may have to go grab a Milky Way from the refrigerator just to calm down! Other companies in non-candy industries are also mentioned in the article for moving jobs back to the US as well, including Farouk, a popular hair care company, and Chesapeake Bay Candle, who will be moving back to Maryland (where their name will make a lot more sense!). In addition to increasing jobs, there is much mention of increasing overall quality, a word that is often very accurately associated with “Made in America”. How Many Copies Would You Make if You Were Printing Chocolate? It’s tough to imagine how long the line for the office printer would be if it was creamy, dreamy chocolates landing in the tray instead of plain old paper, but I’m going to guess much longer would sum it up! Before you get too excited, we unfortunately haven’t heard that there is an office printer update in the works that involves chocolate, as exciting as that would indeed be. However, we did just come across an interesting article in the Food section at HuffingtonPost.com – The World’s First 3D Chocolate Printer. After watching the video detailing the chocolate printer imagined by scientists at the University of Exeter, we couldn’t help but make countless mental notes of all the custom chocolates we would love to create! The process and purpose of the chocolate printer is explained by Dr. Liang Hao and Professor Richard Everson of University of Exeter. The 3D printing technology is similar to that used in the production of metals and plastics, and Hao explains that using this technology for the purpose of creating custom chocolates will help more people learn about the technology as “chocolate is a fantastic medium to send out the message.” We can’t help but agree! Chocolate is a fantastic medium, period. So how would chocolate printing work exactly? The idea is that it would actually be quite simple. Consumers like you and I would be able to download a piece of software in which we could sketch the chocolate design of our dreams. Once we had created our sweet masterpiece, we would press a button to deliver our design specs to a chocolate machine that would reside in a chocolate shop. The machine would make our chocolate-y dreams a reality, and we would go pick it up shortly thereafter, ready to gift or enjoy ourselves! So why chocolate? Everson elaborates to include that this is a safe way to get people interacting with the technology, saying, “Chocolate is a very easy place to explore how that might happen because chocolate isn’t a safety critical system in any way. We wouldn’t want people designing airplanes online, but of course, chocolate, if it goes horribly wrong, then all you have is a mess of chocolate…” Mmmm…a mess of chocolate. Sounds like this plan is good no matter what happens! If the chocolate printer becomes a reality at your local chocolate shop, what will your first custom creation be? I think ours would be a chocolate rendition of Captain Candy, Blair Candy’s resident superhero! But we’d love to hear from you in the comments!